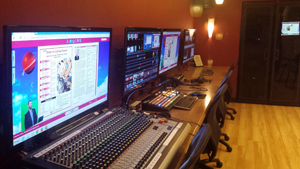 Completely rebuilt in 2012, Control A is centered on Newtek’s TriCaster 860 Production System. 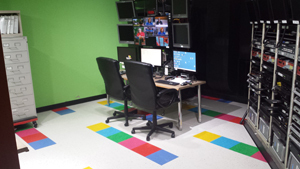 Comfortable and productive, the room offers an inviting and creative environment to produce shows. The TriCaster features “virtual sets”, to make your talent appear on a Hollywood quality production without the cost and complexity of building a real set. The Soundcraft 24 channel audio board lets an operator focus on mixing quality sound. Our training program and staff assistance allows community producers to access the latest tools for creating their vision. 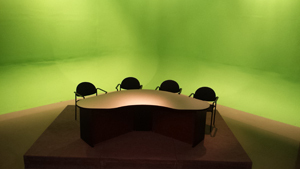 MVCC's Studio is a 45' by 42' acoustically treated production area equipped with 3 Sony HCX-D70 High Definition studio cameras, computer based teleprompter and Access lighting system with florescent and LED lights. A 35’ chroma key green curved seamless Pro Cyc wall allows for full HD virtual set productions. Watch the cyc wall construction time lapse here. Black or grey curtains are also available. Additional HD cameras can be used on the jib or hand held for special projects. The studio has easy access for delivering larger sized props. Edit suites C, D and E run Adobe Premiere and Photoshop Elements 13 software, a simple to use, yet amazingly powerful program to edit your HD footage and create files for TV, DVD and the web. 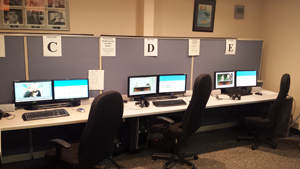 Each suite has 2 monitors and headphones for privacy. Our complete 65,000 track DeWolfe music library is available online. Advanced users can request training and access to our higher level Premiere Pro edit suite. Field gear available to volunteers includes Sony NX-70 camcorders, GoPro Hero3 action camera, Lowell lighting kits, Bogen tripods, portable HD monitors, Sennheiser shotgun and wireless lavalier mics and Shure hand-held microphones along with an intercom system. Advanced users can opt for the Black Magic 4K 1ME multi-camera HD portable video switcher kit with intercom. 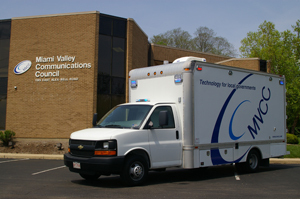 MVCC provides 24 hour programming on 4 channels through Time Warner Cable and AT&T U-Verse, as well as live streaming and on-demand at mvcc.viebit.com and mvcc.net. We utilize the Leightronix Ultra Nexis hard-drive based playback system to play programs. 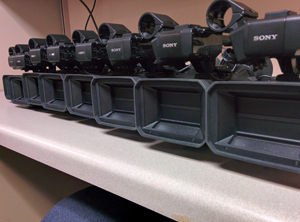 Each of our 8 cities have a fiber optic feed for live city council meetings. Several satellite dishes provide access to expanded content. Our 16’ box truck features a Newtek Tricaster 855 Extreme and 3 Sony NX5 HD cameras with 7” HD viewfinders and Vinten tripods. Redundant recordings are made to Atomos Ronin recorders. Clear-Com intercom and Mackie 16 channel audio board help on the audio side of productions. The vehicle also functions as a police and fire mobile command post, outfitted with internet, 2 Wi-Fi cameras, a roof mounted camera, 800MHz radios, lights and sirens. The 7Kw generator provides ample power for all the video gear, plus microwave and refrigerator. 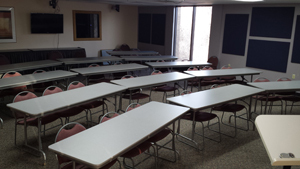 MVCC's 2nd floor Teleconference Room has tools available to the lecturer or presenter. A video projector and 42” flat screen display various sources. An internet connected computer with wireless keyboard and mouse makes presentations easy. Wi-Fi in the room is secure and open for guests. The teleconference room is modular and can accommodate up to 50 people. Refreshments are available in the neighboring kitchen. Sessions can be recorded with our multi-cam production system. A small teleconference room is available for smaller meetings, and includes a 42” flat screen monitor for the computer. These rooms are not available for public use.